Set on the top 16 floors of ICC, The Ritz Carlton - showcasing a blend of contemporary design and elegant comfort – is the tallest hotel in the world. On the 100th floor of ICC is sky100. Standing at 393m above sea level, sky100 is the highest indoor observation deck in Hong Kong. The tallest building in Hong Kong, now a prominent hub for international business and finance. ICC and two ifc on the opposite shore, both major landmarks in Hong Kong, together form the stunning, world-famous Victoria Harbour gateway. A name embodying the prestige of the world’s largest diamond, is now an exclusive residential development ranking with the finest in the world. 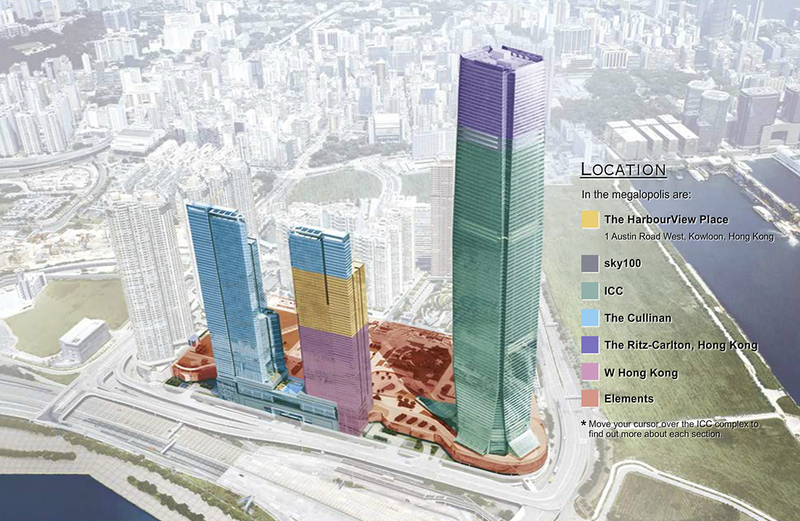 The HarbourView Place is located at the heart of the ICC Megalopolis, an admirable address by Victoria Harbour. The cosmopolitan hub embraces everything a city lover can dream of. A chic, influential and innovative lifestyle icon, W Hong Kong offers state-of-the-art facilities and exciting dining, nightlife and entertainment options. A high-end retail destination of one million square feet housing major international brand names, Elements delights the city with a parcel of shopping, dining, leisure and entertainment in style.